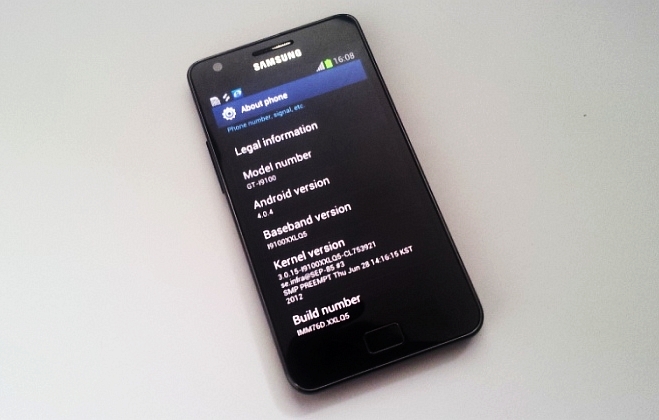 If you are a Galaxy S II user, chances are that you have been running Android 4.0 for a while now. However, the current version of ICS on the Galaxy S II is Android 4.0.3, and not the latest 4.0.4 found on phones like the Galaxy Nexus and the Nexus S.
The guys over at SamMobile.com have come across an official Android 4.0.4 ROM for the Galaxy S II. No proper changelog is available at the moment but if you have used it on the Galaxy Nexus you’d know that 4.0.4 only brings minor improvements. Since this is a full ROM, you will have to flash your phone with it, which will result in complete loss of data (unless you do a backup). If you’re fine with that, you should proceed to the source link to download it, or else wait till Samsung starts rolling it out over-the-air.